Preparations & Dosage: Best used as a tincture made from fresh plant material for internal use. Take 60 drops, 2-3 x daily For topical ulcers, use oil made from the fresh plant, or fresh plant juice, applied directly to the affected area frequently. The genus name Stellaria is derived from the Latin stella, "star, " in reference to the shape of the flower. The species name, media, is Latin for "medium." Chickweed can be an annual or perennial and is native to Eurasia. It grows in moist shade in gardens, waste places, and suburban lawns. It has a weak stem with a line of white hairs on one side. The leaves change direction with each pair. The tiny white flowers are deeply cleft; they begin blooming in late winter and close in cloudy weather. The seeds are borne in shiny black capsules. 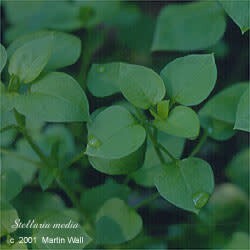 Chickweed makes an excellent ground cover, as it grows outward, not upward. The plant helps the soil retain nitrogen; its existence indicates fertile soil. Chickweed nourishes yin fluids, clears heat, reduces inflammation, dissolves plaque in the blood vessels, and clears toxins. It is traditionally given to strengthen the frail. Chickweed is used to treat appendicitis, asthma, bladder irritation, bronchitis, constipation, cough, cysts, hoarseness, obesity, pleurisy, rheumatism, thyroid irregularities, tuberculosis, and ulcers. Topically, chickweed can be used as a bath herb to soothe dry skin and chicken pox or as compress, poultice, or salve to treat boils, burns, diaper rash, eczema, hemorrhoids, itchy skin, nettle sting, psoriasis, rheumatism, and varicose veins. The fresh juice can be applied to eyes to treat cases of infection such as conjunctivitis. Chickweed is edible raw or cooked. It can also be juiced. Chickweed is considered an herb to promote weight loss. The seeds are consumed by more than thirty kinds of birds, poultry, rabbits, and pigs; in fact, at one time the herb was referred to as chickenweed. Excess use may cause diarrhea.